There are a lot of great things about this Deer Makeup Kit, but one of the unexpected perks is that simply using it will make you more deerlike—you'll have to sit very, very still and pay keen attention if you want to take your woodland look from average to amazing! 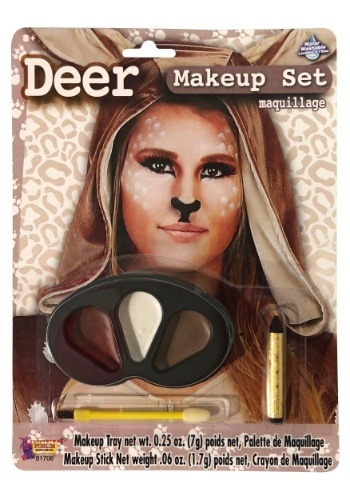 Let's face it: makeup is where it's at to take an animal look to the next level of costume cool. Ears and tails and faux fur are nice and all, but an animal's face is its most distinct feature. If this all sounds complicated, don't worry—this set is designed to help you master a look you can really fawn over! This kit is handy and informative, and it even has application instructions printed right onto the package. It includes a makeup tray in shades of brown, a black crayon stick, and a sponge/applicator. Best of all, it washes off easy with soap and water, so you can practice a few times to get the look perfect, and easily return to your naturally beautiful self when the party's over! Now that you've nailed your forest-ready look, you'll need to practice another deer-like quality: agility. We don't really have a product to help you with that, but good luck getting your movements to match your spot-on costume!